Inverter generators are the newer generator type and with any new development you can expect a few upgrades. Inverter generators have many advantages compared to conventional portable generators but there are still plenty of people wondering whether an inverter generator is the more suitable option. This is because there are two downsides associated with inverter generators; price and power. The question is whether the many advantages of an inverter generator outweighs its disadvantages. To help you come to a conclusion, here is an overview of all the advantages and disadvantages of an inverter generator. Consider each aspect for your own specific situation to find out whether an inverter generator is a true upgrade for your off-grid electricity needs. There are several perks of having an inverter generator that you would not likely have with a conventional portable generator. Depending on when and where you plan to use the generator, these perks might be the deciding factor. In general, manufacturers design inverter generators with portability in mind. Most models of inverter generators are more lightweight with carrying handles and sometimes wheels, as well. One of the reason why many inverter generators are more portable than conventional fuel-powered portable generators is because inverter generators tend to have a smaller fuel tank. For the amount of power they produce in combination with their fuel efficiency, there is no need for a large fuel tank in inverter generators. In other words, inverter generators don’t produce as much power as an average generator and so don’t need as much fuel to reach their maximum load. Inverter generators are more fuel efficient than conventional fuel-powered generators. This has to do with how the engine runs. In a regular portable generator that runs on gasoline, the engine runs at 3600 rpm constantly because that is the speed it needs to run at to deliver 120 volt and 60 Hertz. An inverter generator, on the other hand, does not need to run at 3600 rpm to still deliver clean electricity that is safe for sensitive electrical devices. An inverter generator adjusts the speed at which the engine runs to only what is required by the load. Thus, an inverter generator can run at a slower speed which saves energy so less fuel is needed and it also reduces the total harmonic distortion (THD). Being more fuel efficient means that inverter generators need less fuel to run for the same amount of time as a conventional fuel-powered generator. This is why there is no need for a large fuel tank in most inverter generators. Inverter generators make less noise than conventional generators. Most inverter generators produce noise at less than 60 decibels which is the volume of an average conversation while a conventional portable generators sound more like lawnmowers. There are two reasons why inverter generators are more quiet. The first reason has to do with its mechanics and the second reason is a matter of design. Firstly, an engine that runs slower and steadier produces less noise. This is the case with an inverter generator so how the machine runs already plays a role in making it the more quiet option. Secondly, manufacturers pay more attention to creating a noise-reducing design with inverter generators by using an enclosed casing, installing mufflers etc. Being more quiet is a big selling point of inverter generators so its manufacturers try to enhance this quality even further. Inverter generators are often described as delivering clean electricity. What this implies is that the frequency of inverter generators is steady with a minimal harmonic distortion or THD. You can observe this ‘clean electricity’ by looking at a graph of the sine waves produced by an inverter generator. An inverter generator creates perfect sine waves without any clearly visible scratched scratches like the frequency of a conventional generator does. The clean and steady electricity supply of an inverter generator is comparable to what the electricity supplier sends through the mains supply. This makes inverter generators safe for connecting to sensitive electronic devices like mobile phones, medical machines and laptops. The clean electricity is also why some recreational inverter generators don’t need to be connected to a mains supply with a transfer switch but can have certain appliances connected directly. This a great advantage for when you need power during outdoor activities like camping. Though the average inverter generator holds about 2000 – 4000 watts power, there is a way to double that power. Many newer inverter generator models have parallel capabilities. A parallel capable inverter generator can be connected to a second inverter generator of the same model to have double the power without needing an extra transfer switch connection. With more power, inverter generators become an alternative for a home backup generator. Inverter generators are not perfect since there are disadvantages to everything. Thankfully, inverter generators only have few disadvantages but these might still influence how suitable they are for the task. The average sized conventional generators are more powerful than the average inverter generators. 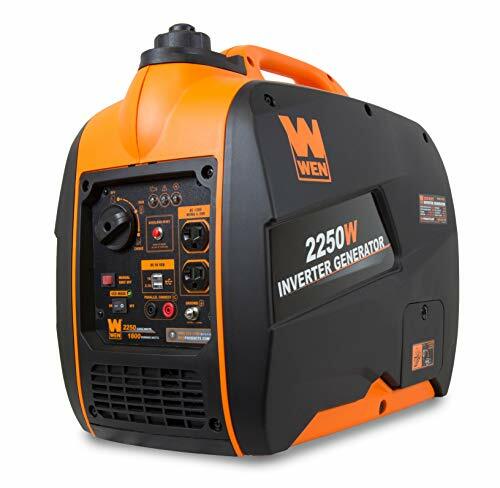 Most inverter generators hold around 2000 – 4000 watts of power while most other portable generators starts around 4000 watts of power. If you need to power a home or heavy duty machinery and tools, an inverter generator might not be powerful enough for. Inverter generators are more suitable for outdoor activities, RVs and powering a few household appliances during emergencies. For all its advantages over conventional generators, inverter generators tend to carry a higher price tag compared to the cost of a portable generator for example. This is a matter of you get what you pay for. The question is whether you have the budget for it and whether the other perks are worth buying a generator that is less powerful. When you start listing the advantages and disadvantages of inverter generators you notice that there are more pros than cons. However, the only two disadvantages, price and power, are still very important factors to consider when making a purchasing decision. There is no clear answer as to whether an inverter generator is better than a conventional portable generator. It really depends on how often the generator is to be used and for what purpose. Inverter Generators VS Conventional Generators - What's the Difference? Why are Inverter Generators so Quiet? Inverter Generators VS Conventional Generators – What’s the Difference? Cost of Portable Generators: How Much Should You Pay? BestGenerator.org is a participant in the Amazon Services LLC Associates Program, an affiliate advertising program designed to provide a means for website owners to earn advertising fees by advertising and linking to amazon(.com, .co.uk, .ca etc) and any other website that may be affiliated with Amazon Service LLC Associates Program. Materials, photographs and articles (collectively, “Content”) on BestGenerator.org, are for informational purposes only. The Content is not intended to be a substitute for professional advice, analysis or instruction. You should not disregard professional advice because of something you have read on BestGenerator.org.